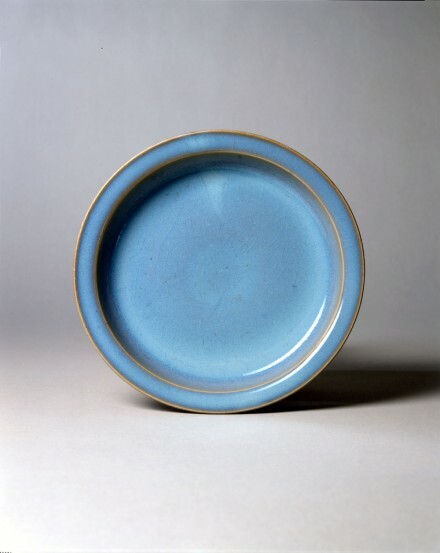 of shallow form with narrow everted rim, covered with a fine thick lavender-blue glaze of pale opalescent tone on the interior, thinning to a buff tone around the upper margin of the well and over the lip, pooling to a brilliant sky-blue color on the underside and continuing over the foot and base, with thick droplets of glaze coagulated over the foot, decorated on the underside with four splashes of bright reddish-purple suffused into the blue glaze, with an unglazed area within a circular recess in the center of the flat base showing the exposed pale stoneware burnt reddish-brown in the firing, encircled by three large ‘spur marks’ left from the kiln supports. A splashed Junyao dish of this form and size in the Palace Museum, Beijing is illustrated in Gugong Bowuyuan Cang Wenwu Zhenpin Quanji, Liang Song Ciqi I, Vol. 32 (The Complete Collection of Treasures of the Palace Museum, Beijing, Porcelain of the Song Dynasty, Book I), Hong Kong, 1996, pl. 230, p. 254. Another example from the Alexander Collection, now in the Percival David Foundation, London, is illustrated by Pierson, Song Ceramics: Objects of Admiration, London, 2003, no. 47, p. 120. Compare also the splashed Junyao dish of this type from the Eumorfopoulos Collection, now in the Victoria and Albert Museum, illustrated by Kerr, Song Dynasty Ceramics, London, 2004, pl. 26 right. Another similar Junyao dish in the National Palace Museum, Taipei, is illustrated in A Panorama of Ceramics in the Collection of the National Palace Museum: Chün Ware, Taipei, 1999, no. 56, pp. 148-149.